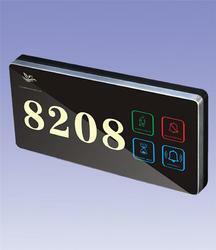 Our range of products include phl series hotel room lock and prm series hotel room number plate. 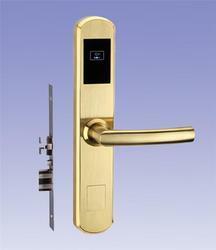 Phoenix Hotel Room Lock Series consists of smart locks for hotel rooms that have RFID card keys. It facilitates 'No-Touch' unlocking of hotel room using RFID card. Hotel Room lock with RFID Crd keys : 'No-Touch' unlock. Stylish and sturdy designs : Stainless steel head and handle. Alkaline battery powered : Works on 4 AA sized batteries. Easy to read/write RFID Card using USB type RFIS card reader/writer device. Easy to program and collect data from locks using handheld portable deivce. Backup mechanical key to unlock the door. Three different models available in 2 colours : Gold and Silver. Phoenix Hotel Room Number Plates display the hotel room number and other indications using attractive and modern design. Acrylic panel with LED and touch screen buttons. Four different LED light indications for: 'Please Clean Up' , 'Do Not Disturb' , 'Please Wait' and 'Doorbell'. Available in 4 shapes and 3 colours : White, Brown and Black. Customized room number plates with your 'Hotel Name' available.